Live Creating Yourself. 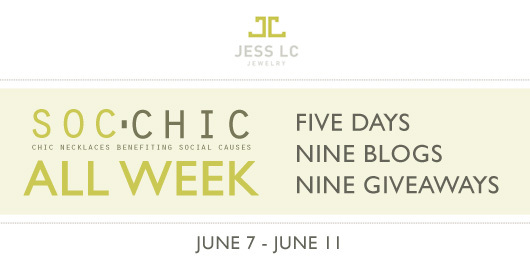 : Soc Chic All Week: Jess LC Giveaway! I am insanely proud to call the beautiful and brilliant Jess of Jess LC jewelry and Makeunder My Life blog a friend! I was thrilled when she asked me to participate in a giveaway she is hosting throughout the blogosphere this week. One of her jewelry collections, the Soc Chic line, includes nine necklaces, each of which has its own positive message and a coinciding non-profit organization. That's right - 10% from each Soc Chic necklace sale goes to its designated non-profit, which makes these beauties that much more special. What a wonderful gift to give to a friend or family member! To raise awareness of the line, Jess sought out eight other bloggers to take part in hosting her generous giveaway this week! That's right - there are NINE necklaces to be won, all of which are part of her Soc Chic collection! And you have until Friday, June 11 to visit the other blogs and sign up for a chance to win them! 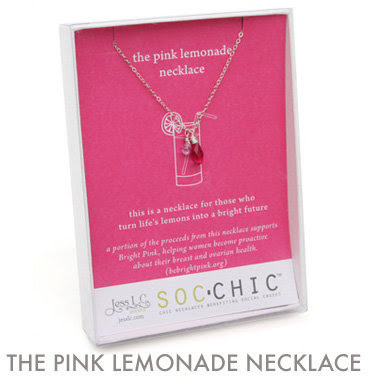 Here at Live Creating Yourself, you have the chance to win the Pink Lemonade Necklace! 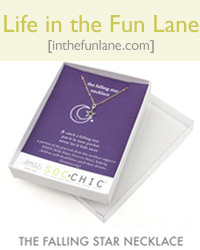 According to the Jess LC website, "this necklace is for those who turn life's lemons into lemonade." Two hand-wrapped Swarovski crystals dangle from either a gold-filled or sterling silver necklace. The Pink Lemonade necklace coincides with the Bright Pink NPO, a group "that provides education, support, and a sense of community for young women at high risk for breast or ovarian cancer." Wow. Talk about female empowerment. I think every girl and woman should have one of these in her jewelry box. 2. Leave a comment here mentioning what your favorite collection or piece of jewelry is! 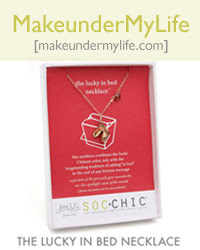 And be sure to hop on over to these other blogs for a chance to win the respective Soc Chic necklace! Purchasing this necklace supports the Care. Commit. Change. organization. Purchasing this necklace supports Imerman Angels. Purchasing this necklace supports smaller non-profits. Purchasing this necklace supports Team In Training. Purchasing this necklace supports the Cystic Fibrosis Foundation. Purchasing this necklace supports the Kids Enjoy Exercise Now organization. Purchasing this necklace supports the Paws 4 People organization. So does this make for a Happy Monday or what?! great giveaway. i love the match made in heaven necklace. I love the Astor collection - it's all fantastic. Thanks for the great giveaway! What a great giveaway! I have always loved the Astor Two-Tone Cluster Bib Necklace. love the state single long eye necklace. fabulous! keeping my fingers crossed! i love the match made in heaven necklace! I LOVE the PINK LEMONADE necklace! It is beautiful on its own AND the message and corresponding charity are both very close to my heart. i love the chevron necklace and the pink lemonade necklace. but, of course, who doesn't love pink! Love the Astor Shore Ribbon Cluster Necklace! Happy Monday! I like the chevron necklace. I like the Rush Collection, especially the Medium Vertical Crystal Necklace, absolutely stunning! Thanks for the giveaway. I love the silver lining necklace, but they all are beautiful and send a great message with the explanation! The Wellington collection is my favorite, but it was hard to choose just one! I love the Division Chevron earrings as well! I love Armitage collection, but the pink lemonade necklace seems especially appropriate in my life right now. sooo lovely, really dig the state collection! I love the bright side necklace! I love the Astor Double Bead and Link Necklace! I love the Good Intentions necklace! I loved the armitage two strand necklace because I live right off of armitage! I just realized that her collections are named after Chicago streets! So chic!! I really love the Bright Side necklace. “The chrysanthemum, a Japanese symbol for the sun, serves as a reminder that after every dark night comes a brighter day.” What a great sentiment. I like the good intention necklace because I'm a sucker for things that remind me of love. LOVED meeting Jess at the ChiBlogger meetup and you know I am a huge fan of this altruistic consumerism idea...I had NO idea how cute her stuff was and that packaging?? Loves. I like the division chevron earrings. I love the Bright Side necklace--so much so that if I don't win the giveaway, I'll definitely have to buy it! OHhhh everything is so pretty. My favorite collection is the Astor collection. 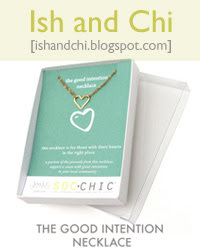 I love the entire Soc Chic collection; I just adore the idea of a necklace with such importance behind it. Absolutely adore her work, love the gold heart bracelet, and the chevron earrings, she is a sweetheart and her work is amazing! Thanks!! I love the Astor Strawberry Ribbon necklace. Beautiful! What an awesome giveaway! I'm pretty much in love with the whole Astor collection. I love all the colored beads! I'm a big fan of the chrysanthemum necklace from this collection, and the pink lemonade one is also cute! What beautiful necklaces with such amazing causes! I think my favorite is the Bright Side Necklace. But I love them all! I love the Astor Cluster Bib Necklace in coral...it's so perfect for summer! This has to be the greatest giveaway ever!! My favorite one is the M Loves M necklace since mine and my BF names both start with M. But it's a tough decission! I love the Bright Side necklace! This is such a great giveaway! I think the bright side is the cutest, what a great giveaway. i really love the astor collection, it is so fun! I love love love the Armitage Simple Cable and Link Bracelet. But the Pink Lemonade necklace is so fun and summery! I am obsessed with the Astor collection! Swoon. I love the Madison and Astor collections best! I love Division Chevron necklace. I love the Astor collection! The necklaces aon the site are amazing! I absolutely adore the The Raindrops on Roses Necklace for two reasons, 1. it is so beautiful, 2. it supports cystic fibrosis, a disease that my cousin has beat and that my family is big supporters of! I will be telling everyone I know about this website! My favorite thing from the site is the State Double Leaf Necklace. i like the fortune cookie and the heart and well, all of them! I love the Sright Side Necklace and Lucky in Love (that one's adorable)! My favorite line is the Soc Chic line. I love that wearing some beautiful jewelry can support people in need. I adore the Astor and the State collections. It's all so pretty! I love this necklace!! So pretty! Wow! this is such a great idea. i love the soc chic line. Like the whole Soc Chic Collection. Especially; The Soul Mate Necklace, what a cutie and The Raindrops on Roses Necklace also great. This is beyond fantastic. I love the lemonade necklace, but I think I really need the Good Intention Necklace. Any of these necklaces would remind me every day to be a bit better of a person. So great. I love the raindrops on roses necklace! I love the Astor Strawberry Ribbon Cluster Necklace! My fave is the 2 strand, 3 link! What a great necklace!! Here from M loves M! Bea-U-tiful! totally love it and think it's a great cause! I LOVE the Soul Mates Necklace! lucky in bed is so cute! 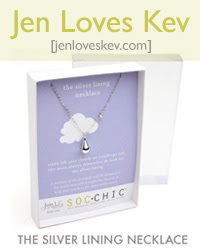 I love ALL of the Soc Chic necklaces! My favorite is definitely the sole mate necklace. Thanks for the chance to win. I love the Armitage One Link necklace with pearl. My favorite are the Madison Crystal and Link earrings. I adore earrings! love the match made in heaven necklace! i really like the soulmate one. This giveaway led me to your blog - and I love it! SO in awe of your house! I love the fortune cookie necklace the most, but I think the pink lemonade tag line is gorgeous. The Astor line is awesome! Thanks for the giveaway. Love the Astor line, especially the coral colored necklaces, they would go with so much! Please, enter me in the give away! Thanks! I love the Astor Coral necklace..stunning! Such a fantastic giveaway! I really love the Armitage line but really, it's all fabulous! I love the Soc Chic line. It's beautiful. How lovely! My grandmother fought a courageous battle with breast cancer and I've always admired her courage and grace. I'd be proud to wear this in her honor! All the jewelry is adorable. lovely necklaces and great cause! I love her Division Teardrop Necklace...So classy yet modern! Um, I am LOVING the response this giveaway is getting in blog land! My favorite Jess LC piece or collection? Division! I love the Soc Chic collection and the Bright Side is my favorite! This is such a cute necklace! I think it's my favorite of them all, so winning this would be amazing! After browsing your jewelry site, I have to say that the Soc Chic line has won my heart. I love how each piece looks like a little treasure...you know, one of those necklaces that you put on and never want to take off. Plus, you can't beat that part of the purchase price goes to a great cause. The pink lemonade necklace is just beautiful! I love the whole Astor collection! I love the Astor Double Bead and Link Earrings in Shore. So cute! I like the Rush collection especially the Baroque pendant. Thanks! The bright side necklace is very nice. just discovered your blog through this giveaway! i love so many of Jess' pieces but my fav of the moment is the Division Chevron Bangle because I'm on a hunt to improve my bracelet collection and this piece is so perfect! I heart the Pink Lemonade necklace!!! My favorite is The Raindrops on Roses Necklace! My favourite is the Rush Collection, or the Soc Chic Collection (especially the 'Silver Lining Necklace'). my favorite is the silver match made in heaven. I'm a sucker for angel wings. The causes are all marvelous. I love the Astor Bead and Link Necklace. It is so pretty! Armitage Simple Cable and Link Bracelet is my JessLC fave. The Soc necklaces are great. Thanks! so beautiful. soul mate has to be my favorite... even after looking at the store! love it! :) please enter me in. I love the "Lucky in Bed" necklace! How can you go wrong with a fortune cookie?? I have a terrible time picking a favorite, but I really love the SOC line, especially the pink lemonade and lucky in bed necklaces. Great giveaway! My favorite item in her store is the lovely Astor Bead Strand Necklace! Great giveaway! I love the Astor collection - especially the Astor cluster bib necklace! the raindrops on roses is so cute! I love the Madison Three Strand Bold Stripe Necklace! I love the simplicity and elegance of the State Large Circle Necklace. wow! so pretty and cute! i love all of these and the bright side neclace is my 2nd favourite! is this international? i hope it is! these are all so cute. i think my favorite one is the good intentions necklace. not only is it pretty, but its a good reminder of where your heart really should be. thanks for giving us all a chance to win! I love the Armitage One Link Necklace with Pearl but everything there is beautiful! I really like my Astor Cluster Bibb necklace. Next runner up would be anything in the Armitage collection. I love this one the best... I think because I love the name!! Thanks for the chance to win. cute necklace, and a great reminder to look on the positive side of things. Love the chevron necklace (or anything in the Division collection)! Wonderful giveaway! 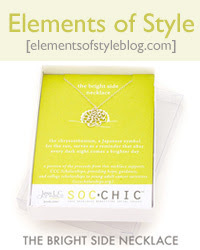 I found your blog thru elements of style and love it! I also love the soul mates necklace...so lovely! i love both the pink lemonade one and the bright side one...nothing like having a constant reminder to think positive! I LOVE the "Wellington" collection! The pieces themselves are so delicate, and the mix of silver and gold metals makes them slightly edgy too. Perfect combo! I really do like her Soc Chic collection best, so I'm thrilled to find out about this give away. i love ALL of the necklaces, the causes and that you're giving them away! I like the bright side necklace. I'm loving the division collection, but the soc chic collection is such a fabulous idea! I looove all of them! 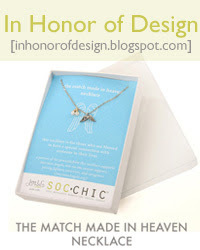 But I can only choose one so I`d say the match made in heaven necklace is the best! I am torn between M Loves M and Jen loves Kev! Both are beautiful! This is such a wonderful idea for a giveaway! Nothing better than helping out, the Pink Lemonade necklace is gorgeous! I love this giveaway! All of her stuff is to die for, but I especially love the Madison and Armitage collections. Such pretty jewelry! I absolutely L-O-V-E the Soul Mate necklace! i love the Silver Lining necklace! This one is really great for several reasons- that it's really pretty, and that pink lemonade is my favorite cold drink (apart from milk), etc. 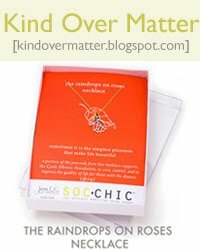 But I think at the moment my very favorite Jess LC piece is the Soc Chic Soul Mate necklace, because it's just the pretty dainty piece I've been looking for and I LOVE dogs and any non-profit org that's for them too! I love the bright side necklace. It's such a great daily reminder to look up and keep going. Thanks for the chance. L.
I love the soul mate...so pretty! I love her bright side necklace. very glad i stumbled upon your blog! The Lucky In Bed necklace is my favorite. This is great give away for a bunch of great causes! I think this one is my favorite, I love pink! I really like all her jewelry, but if I had to pick a favorite...right now I am feeling the white and gray marble Astor Waterfall necklace! BTW I love ur dinning room, that bird cage is divine! love the chevron necklace + the fortune necklace... so fun!